Why NTP should ALWAYS be configured on your ESXi hosts? 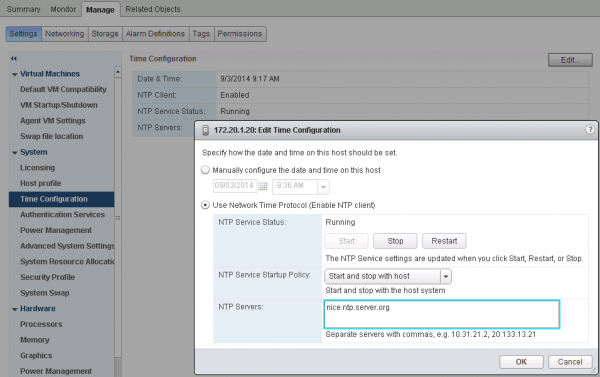 Why NTP should ALWAYS be configured and running on your ESXi hosts? NTP is really easy to configure on vSphere, but is not always considered as important by people who are not synchronizing the time of their guests using VMware Tools. In fact, VMware even recommends to configure time synchronization within guests using w32time or NTP instead of VMware Tools periodic time synchronization. However, the VMware Tools time synchronization controls only whether time is periodically resynchronized while the virtual machine is running. Even if this synchronization is disabled, by default VMware Tools synchronizes the virtual machine’s time after a few specific events that are likely to leave the time incorrect. These events synchronize time in the guest operating system with time in the host operating system even if VMware Tools periodic time sync is disabled, so it is important to make sure that the host operating system’s time is correct. So YES, NTP configuration is VERY important on vSphere hosts: snapshots and live migrations (vMotion) are likely to happen several times per day in a standard infrastructure. Note: there is a way to totally disable Time Synchronization in KB 1189, but wait…why would you do that? I had a customer once that experienced that scenario with a Domain Controller and a 2 hours drift: I let you guess the mess that resulted with the time in the domain, login problems, etc. Another excellent reading is Fabio’s article, SDDC Fundamentals: NTP Infrastructure Design. Definitively, it’s not recommended to synchronize VM time with the VMware tool even the NTP on ESXi is configured. For Windows environment, the Active Directory do it perfectly, for Linux, for some case, it’s a good solution. But NEVER synchronize a Domain Controller with this solution, that’s forbidden ! Indeed, like exposed in the article, VMware do not recommend to synchronize VM time with VMware Tools periodic sync feature. For Domain Controller, a nice document exists: Virtualizing Active Directory Domain Services on VMware vSphere. 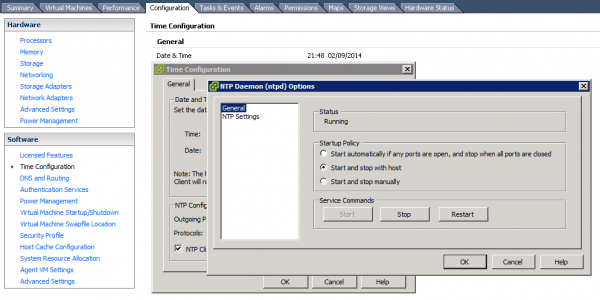 – syncing the AD guests and the vSphere hosts on the same local NTP. For what reason? Why would you like to synch with host at all? ESXi hosts should be also synced with PDC Domain Controller. Isn’t it better to have single point of truth? I would answer that it’s more the opposite : why would you change the default settings (one-time sync during events) ? Do you have a specific constraint to do that ? Do you understand what will be the exact impact ? ESXi hosts should be synced with a reliable physical source of time: it can be PDC or anything else, as long as it is physical, reliable and trustable. Yes it is, but at which level ? In large environment, you can have multiple stratum (layers). Have you read Fabio’s article ? 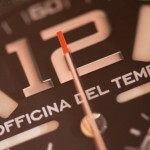 It’s really a nice one about NTP.